In mid-February, a meteor streaked across the sky in Russia’s Ural mountains, which is news to absolutely nobody at this point. It’s one of those events that is almost too big to worry about – it’s so completely out of our control and (apparently) unpredictable. It’s one of those events that makes you see your day-to-day concerns in a new light. All of those gnawing anxieties, which you lie awake trying not to think about – are they suddenly incredibly important, or completely inconsequential? Typically, I have only a foggy notion of the facts relating to the case. What sticks with me is this video, which I’m sure everybody has seen. It’s a series of shots cobbled together from surveillance cameras mounted on cars and buildings. I find it so beautiful as a film! I find it so moving – the first time I watched, it made me weepy. (If you’re thinking to yourself “Pshaw, that’s no uncommon feat these days!” you are, of course, absolutely correct.) The landscape is austere and wintery, bare trees silhouetted against a pale sky. And the camera’s lens distorts the shot to focus everything on the horizon, the distant space where the sky meets the road, where the colors deepen. On the horizon the light changes in colors of dawn or dusk, which makes the road seem strangely lonely. We get a glimpse into the life of a series of strangers as they see it themselves. We hear what they’re listening to, we see what they’re seeing, we catch a hint of their voices. Each one is different from the other, and so distant from my life, so literally foreign. The scene repeats, starting from the same point in time. The light changes, the music changes, but the movement of the car and the movement of the meteor form a pattern, a rhythm that we follow across the sky. And they couldn’t have known about the meteor! As we watch, we know what it is, we know what happened, but the people in the cars, the people in the apartment buildings and walking by the side of the road, they didn’t know. They didn’t know what it was, where it came from or where it would go – this awesome, frightening, oddly beautiful glow. It moves across the sky, transforming the light like the hours of the day or the seasons of the year, but all in one smooth arc, all at once. The silent shots from buildings, with huge flickering shadows giving way to a burnishing radiance that obscures the scene entirely as it passes over, feel like a dream of a memory – too strange and huge to be real, and yet it is. Last week I wrote about the fact that I didn’t have juniper berries. That same day, my generous friend Diane left a little jar of juniper berries in my mailbox! I’m so excited. They’re lovely, a little piney, a little citrusy. I decided to use them to flavor this parsnip tart. I kept the tart very simple otherwise, so that I’d be able to detect the juniper flavor. So the only other seasoning is thyme. And the only other ingredients are shallots and garlic, which play more of a starring role in this tart than I usually allow them. I used gjetost cheese, because I had some left from the other week, but you could easily substitute cheddar or mozzarella, or whatever else you like and have on hand. (And if you don’t have juniper berries, the tart would still be tasty. You could substitute a bit of rosemary, if you have some lying around.) 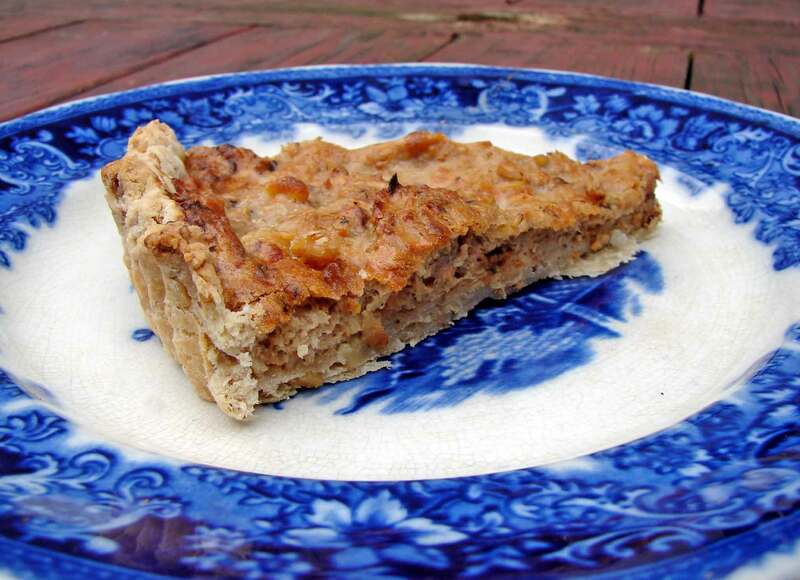 This isn’t a light and fluffy tart, it’s dense and flavorful, and very delicious! Here’s Regina Spektor with On the Radio, in honor of the curiously effective soundtrack of the video. Mix the flour, walnuts, salt and pepper in a large bowl. Grate in the butter. Mix with a fork till it’s like coarse crumbs. Add just enough ice water to pull everything together into a workable dough. Knead for a few seconds, wrap in foil, and chill for at least a half hour. Preheat the oven to 400. Toss the parsnips with olive oil, spread in an even layer on a baking sheet, and roast until browned outside and soft inside, 20 – 30 minutes. Transfer to a large bowl and mash slightly. Melt the butter in a large skillet over medium-low heat. Add the shallots, garlic and thyme, stir and fry until the shallot and garlic are browned and starting to get crispy. Transfer to the bowl with the parsnips and mix well. Grate in the cheeses. Whisk the eggs with the cream, and stir those in as well. Season with salt and plenty of black pepper. Pour the parsnip mixture into the tart shell. Bake for about half an hour, till its puffed and golden brown on the top. Allow to cool and set for a few minutes, then slice and eat. 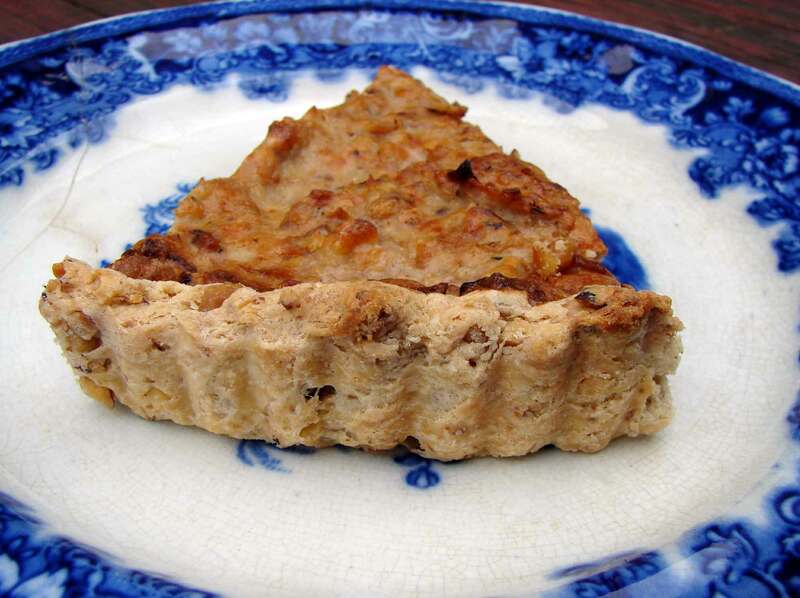 This entry was posted in basic pie filling, crust, recipe and tagged juniper berries, parsnip tart, shallot tart, walnut crust by Claire. Bookmark the permalink. Hello! I think thyme and lemon would be nice with this. And creme fraiche as well…as you can see it’s not the prettiest tart I’ve ever made, and I think the creme fraiche would liven it up. Funnily, there’s a post on the NPR website today asking people for suggestions on how to use juniper berries–you might find some other suggestions there! The NPR story is how the whole debacle started. Au contraire, the tart is very pretty. The texture of the tart shell is very nice, probably the walnuts shining through, and I really think the parsnip base is inspired. I think parsnips are widely underutilized unless they are lost in some generic roasted root vegetable platter. This tart is the kind of thing I would put together for an impromptu lunch. Add a slightly acidic heavy salad and a glass of cold white wine and the guests would be impressed! (sorry for all the typos!) Yikes!